After a long cold Virginia winter, I’m always so excited to spend time with couples in the warmer weather! 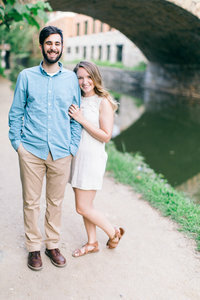 I met David and Emily in Charlottesville at a beautiful secluded water front area called Beaver Creek Park where we got to celebrate their engagement! We can’t wait to celebrate their wedding day in just a little over a month!! David and Emily met their Freshman year of college at Clemson. They were both involved in Cru, a campus ministry, and over the course of a year and a half their friendship deepened through texting about different theological issues and meeting for coffee several times – until they began dating in March of their Sophomore year. David proposed somewhat spontaneously while on a hike on New Year’s Day, and since he had picked up the ring just the day before, he thought it would be a good opportunity to pop the question! He says that the whole hike he wasn’t sure if he was actually going to propose because he hadn’t arranged for anyone to take pictures at the overlook. After not seeing anyone on the trail they were on for the last half of the hike, he prayed that someone would be at the top in a position where he could sneak away and ask to take pictures. They arrived at the overlook and there were two high school girls who had appeared to be sitting there for quite some time. Emily was a little annoyed that they were there because they had the better view! They sat on the lower rock overlooking Lake Koewee. David excused himself to sneak away and wrote a note on his phone asking the girls to photograph his proposal. They happily agreed and did a fantastic job! Maybe it was a good thing that they had the better view! He got down on one knee, asked Emily to spend the rest of her life with him, and she said yes!! They love spending time outdoors – going on hikes, watching the sunrise in the mountains, kayaking. They both have a substantial background of sports that they still like to keep up with recreationally. David will play just about anything but his favorite is ultimate frisbee followed by baseball and basketball. Emily played field hockey and lacrosse in high school but will jump in with whatever everyone else is up to. They also enjoy hanging out with friends, whether it’s an intense game night or a chill movie and chat kind of evening. Tell us a bit about your wedding day! We want the day to be Christ-focused first and foremost, as we seek to be a reflection of the way the Christ loves the Church. We want the day to be full of thanksgiving as we praise Him for what he as done in our lives individually and as a couple. Secondly, we’d like the day to be people focused. We care a lot about our friends and family and want to be able to enjoy this special day with them. We are having a lot of out-of-town guests (from Cincinnati and Clemson) and want them to feel welcomed and appreciated. We’d like for the day to be laid-back and fun! Lots of laughing and dancing!